Mike is a dedicated husband and father of four, as well as a constitutional law attorney who has devoted his life and career to fighting for the fundamental freedoms and traditional values that have always been a priority to the people of Louisiana. For nearly 20 years, Mike successfully litigated high profile constitutional law cases in district and appellate courts nationwide. He is widely recognized as a leading defender of the right to life, religious liberty, free speech, the Second Amendment and free market principles. Mike was elected to the state legislature twice without opposition and served in the Louisiana Legislature from February 2015 to January 2017. As a state legislator, he received top awards from business and industry, limited government, and pro-life and pro-family groups. Mike solidified his distinguished reputation as a principled, full-spectrum conservative as the representative for Louisiana’s Fourth District in the 115th Congress. During his first term, he received the Family Research Council Action’s “True Blue” award for displaying unwavering commitment and consistent support of faith, family and freedom. His 100% on FRC Action’s Scorecard included votes to repeal and replace Obamacare, deliver long-needed tax cuts that are already providing much needed relief to working families, stand for religious liberty, end the forced partnership between taxpayers and Planned Parenthood, and restrict abortion. The National Rifle Association gave Mike an “A” for his work defending our Second Amendment rights, and he was recognized as a “Hero of Main Street” by the National Retail Federation for consistently supporting public policy priorities important to the retail industry and its millions of small businesses. Additionally, the National Federation of Independent Business awarded Johnson the “Guardian of Small Business Award” for his staunch support of pro-growth policies supporting job creators. 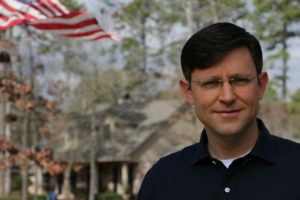 In Congress, Mike was appointed to the prestigious House Judiciary Committee which handles important oversight responsibilities such as the questioning of FBI officials like Peter Strozk and the collection of important documents related to the “Russia investigation.” As a member of the Subcommittee on Immigration and Border Security, Mike introduced legislation to reform our asylum programs, protect our borders and enhance our immigration laws. Mike also plays an active role on the House Natural Resources Committee as the vice chairman of the Subcommittee on Oversight and Investigations. On this committee, he tirelessly fought for issues critical to the people of Louisiana’s Fourth District. Items he supported and introduced included measures to promote the oil and gas industry, rein in excessive government regulation, and support our farmers and ranchers. The eldest son of a Shreveport firefighter who was critically burned and disabled in the line of duty, Mike learned early on the values of hard work, honor and sacrifice. He has a practical understanding of the challenges that small business owners face because he, like his parents and grandparents, was one himself. Mike was also a conservative talk radio host and columnist, a media spokesman for America’s largest religious liberty organizations, a college professor and constitutional law seminar instructor, and a board member for national organizations and numerous community groups and ministries. Mike earned his Juris Doctorate from the Paul M. Hebert Law Center at Louisiana State University in 1998, and earned his undergraduate degree in Business Administration from Louisiana State University in 1995. Mike and his wife Kelly, a Licensed Christian Counselor and former school teacher from Webster Parish, have been married since 1999 and have four children, Hannah, Abigail, Jack and Will. Today, they reside in Bossier Parish.